Ruby Sky quickly picked up the sounds farm animals make (she's an Old MacDonald Has a Farm addict! 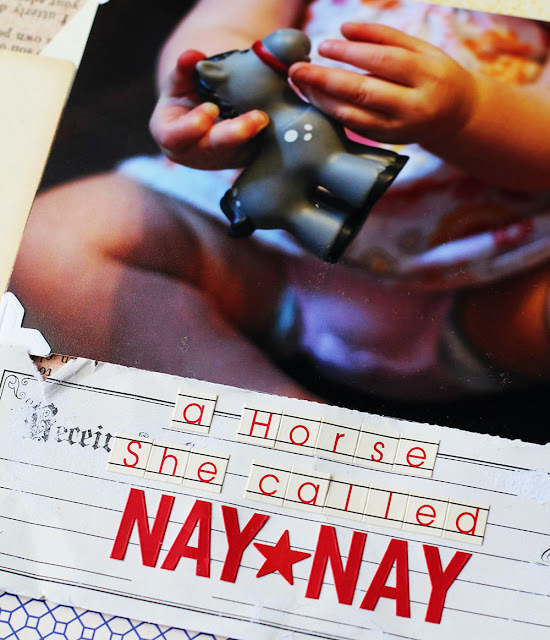 can't get enough of that song...), and after that, every horse she met was called Nay Nay. I really love these red skinny alphas. I have used them a lot lately. I distressed the receipt paper behind the title quite a bit. I loved the shape, it fit my title perfectly, and I liked the lines and perforations quite a bit. But the received/cheque aspect didn't work with my layout very well. I used several types of sandpaper (very find to rough), scissors edges, and my fingers, to distress this paper in layers. I love the faded, worn effect using multiple types of distressing creates. 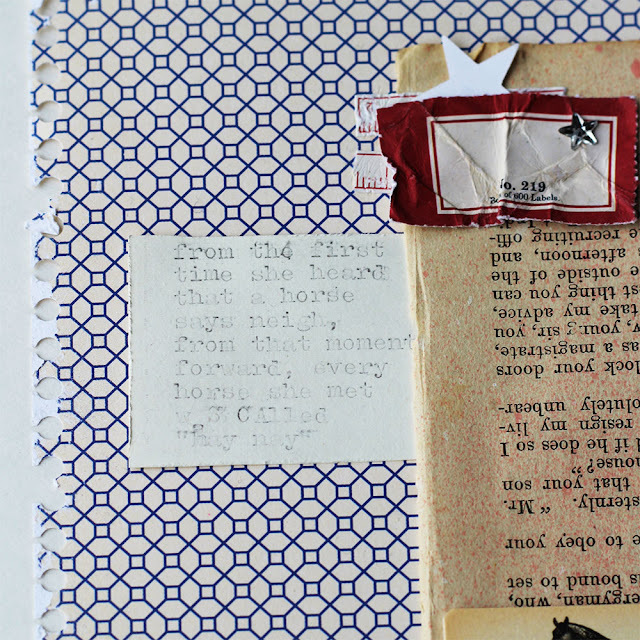 I tucked in lots of little bits and pieces from my Jenni Bowlin Studio stash around the horse card. 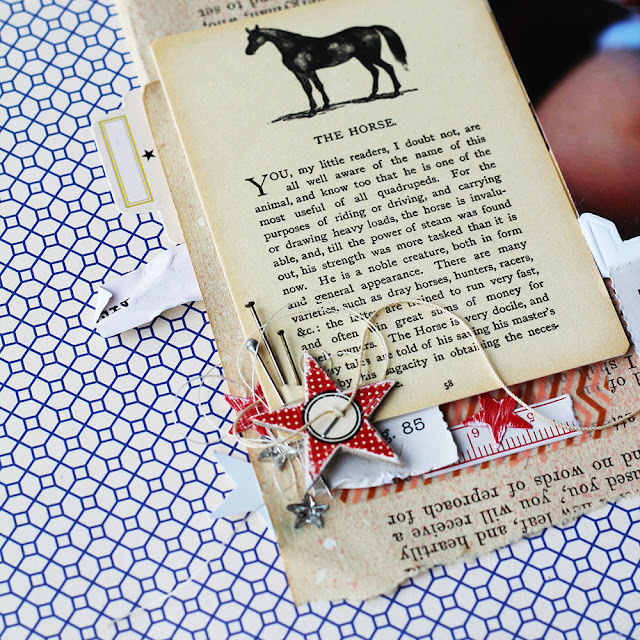 A star sticker placed on star chipboard, then distressed and stapled and knotted with thread. A few straight pins. Some stars -- sanded red stickers, white adhesive rhinesontes, and a punchie -- sprinkled around. A bit of torn JBS figure paper. A piece of ruler sticker from a JBS label sheet. And then some book page, washi, and a nest of tangled thread. I placed another smaller cluster above the horse card, but kept this one much more simple to avoid overwhelming the page too much. 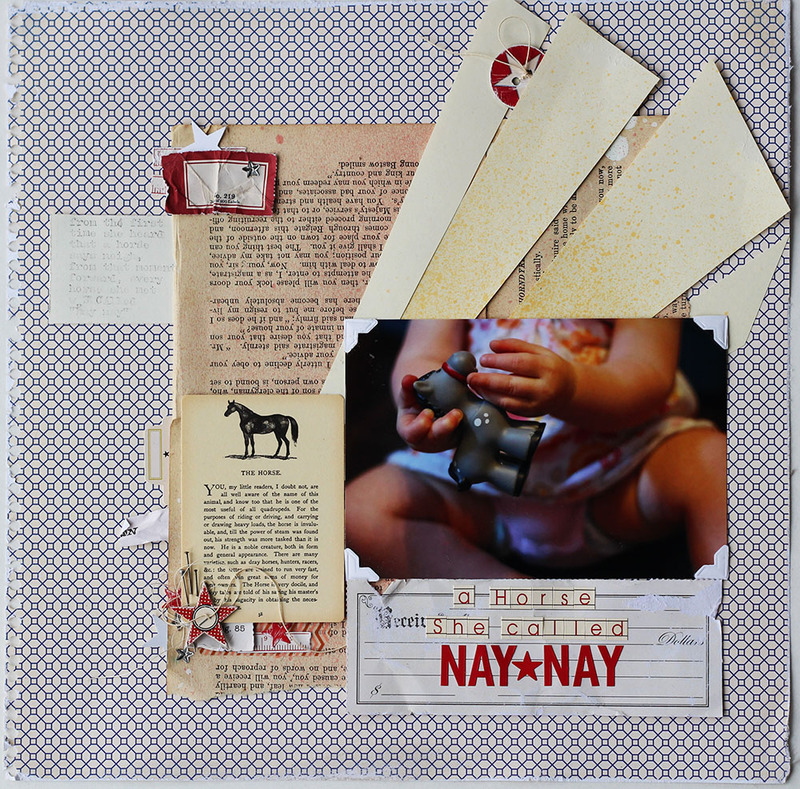 I didn't want that side of the page to be one big pile-up of tangled embellishment mess. I used some similar elements -- a label, the colour red, stars, ruler sticker, distressing, and a white rhinestone star. very cute story and layout! Really like the LO, love the jenni Bowlin to document a child's page without being childish! All the sweeter! Love those chubby baby hands, sweet story and brilliant layout. I just started following you on Pinterest and your blog...and I LOVE this page....it is gorgeous. Love the colors!! Amazing page! Love all the little details and the title, with the photo is adorable! LOOOOOVE IT! This is just fabulous! I love how you've used the playing card. And I really love how you've distressed everything. Straight to Pinterest this goes! !